HTC U11 is the coolest device from HTC which includes an amazing design and comes wrapped with some eye-catching features. To add to its high-end specifications, it is built with dust and water resistant features, has powerful battery life and impressive camera quality. Irrespective of the fact that your HTC U11 is a very compelling Smartphone, it is not free from random technical issues. If you own this device and if you are tired of facing some issues with it, contact us immediately for excellent HTC U11 repair service. Wi-Fi problems- Many HTC U11 users have reported that they are facing very poor connectivity, while others have reported that their Wi-Fi connection does not work at all. Bluetooth connectivity issue- This is another very common issue faced by almost every Smartphone user. Unfortunately, HTC U11 users also complained about this bugging problem. Audio and video are not syncing- This is another issue often faced by HTC U11 users. According to them, while they are trying to play YouTube videos, their videos get stuck in the middle. Even when they restart back, the audio and the video does not match at all. Unable to make calls on Verizon- Many users have complained about the fact that they are neither able to receive any messages nor any calls on Verizon. Edge sense sensitivity issue- Though this feature is one of the main attractions of the HTC U11 users, many users are often experiencing an issue with the Edge sense sensitivity feature. Some users are complaining that the sensitivity is too high while others reported that it is not at all responsive. Apart from the above-mentioned issues, there are some more issues such as problems with the SD card, HTC U11 fingerprint scanner is not working, etc. If you are facing any of the above issues, don’t hesitate to contact us for an affordable HTC U11 repair. Our professionals will perform the troubleshooting procedures and will do the master reset to bring your HTC U11 device back to its factory settings. We provide excellent professional services for your device at a fair price. So trust in our services and get your job done quickly without any hassle. 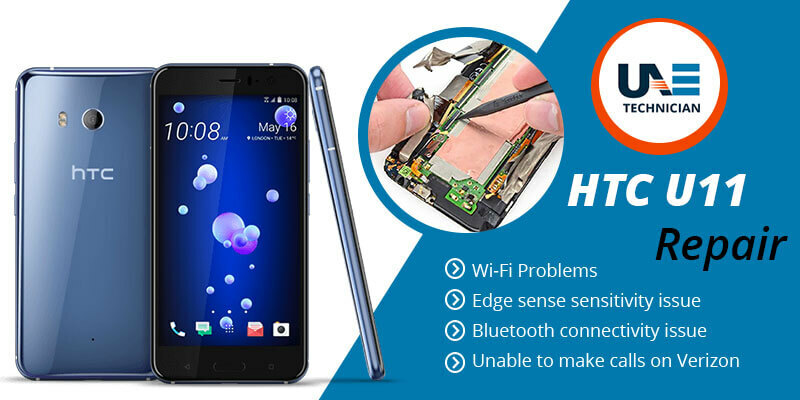 You can call on our helpline number 042053349 for availing quality HTC U11 Repair Service. You might opt for other options for communicating with us that include live chat support and email support. Feel free to take advantage of our email and live chat facility and resolve your problems in no time. We also provide HTC One X repair service.